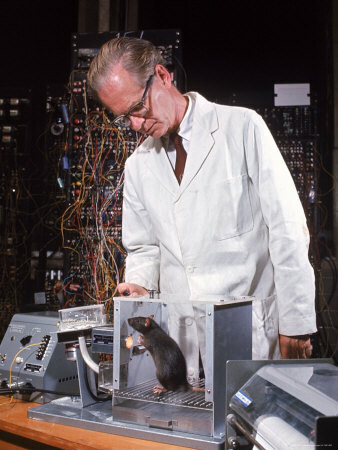 Pavlov’s work on classical conditioning (Pavlov, 1927) and Skinner’s concept of operant conditioning (Skinner, 1953) have provided the blueprints for evidence-based applications in behaviorism. Behaviorism has since proven effective, for example in the diagnosis of patients with mental disorders by operationalizing the acquisition of new behavior (Barrett & Lindsley, 1962), improving item-recall for dementia patients (Dixon et al., 2011) or for conditioning students in military and technical education (Gökmenoğlu & Kiraz, 2010). A central strength of behaviorism is that results can be reliably reproduced experimentally such as in a Skinner box or similar apparatus. This evident advantage translates into several distinct counter-arguments. Firstly, behaviorism does not acknowledge active human agency, this is conscious self-awareness (Chalmers, 1996) which is typically mediated via language. Key properties of human agency are intentionality, forethought and self-reactiveness (Bandura, 2006, p. 164-165), all of which play no role in behaviorism. Secondly, a behaviorist perspective can not explain how people make procedural decisions or negotiate between various types of potential rewards and goals. Most of human behavior is not based on conditioned, convergent reflexes on a single task, but correlates to preceding mental processes that are divergent and collaborative in nature (Funke, 2014; Eseryel et al., 2013; Hung, 2013). Besides, divergent thinking is related to developing interpersonal trust (Selaro et al., 2014). The Theory of Planned Behavior (Ajzen 1991, 2002) could be regarded as the anti-thesis to behaviorism since it postulates attitudes, norms, a person’s perceived behavioral control and intentions as precursors to behavior, rather than specific environmental stimuli. Since reflexes are strictly defined as physiological interactions, behaviorism cannot explain individual differences in human learning, variations in learning- styles and the influence of personality on learning (Rosander, 2013; Kamarulzaman, 2014). The neurological functionality of reflexes is constrained to given brain organization (Goffaux et al., 2014) and neurotransmitter processes (Striepens et al., 2014) and excludes higher brain functions invoking mental processes (Degen, 2014). Behavioral studies and therapies in clinical settings also run into ethical problems on how to obtain legal consent for behavior modification, such as for patients with mental disorders and neurological impairments (Digdon et al., 2014). One of the distinguishing differences between humans and animals is the use of language. Using an Information Theory approach, Reznikova (2006) concludes that animals produce no syntax and provide little evidence for the learning and modification of signals (Reznikowa, 2006, p. 9), a notion shared by Seyfarth and Cheney (2009) who state that learned, flexible vocal production is relatively rare. A predictable, communicative system is absent in the animal world (Seyfarth & Cheney, 2009, p. 97-98) while signals are limited to specific contexts such as greetings, infant distress or predator alarm (Marler & Tenaza, 1977; Snowdon, 1986). Human language development, by contrast, is tied to the development of Theory of Mind (ToM) skills (Miller, 2006). Language acquisition by reinforcement (Skinner, 1957) can neither sufficiently account for the semantic and pragmatic dimensions of coordinated human speech, nor for the meta-contextual quality of its acts (Chomsky, 1983; Searle, 1969). By ignoring cognitive development (Skinner, 1950), behaviorism deprives itself of fully understanding the role of behavior such as e.g., children’s joint attention, engaging in imitation and play-behavior, not only as precursors to language but for the parallel development of mental abilities (Charman et al., 2000). Animal studies can be compromised by animals being exposed to uncontrolled pain and stress variables (Rollin, 2006, p.293; see also Watanabe, 2007). An anthropomorphized interpretation can furthermore lead to biased reporting. For example Martin Seligman’s behavioral dog experiment (Seligman, 1975) follows such anthropomorphism. Seligman found that when animals were given electrical shocks that they were not able to prevent (and subsequently surrendered in apathy) they tended to react similarly inactive in situations where they could have avoided punishment. Seligman concluded that the same was true for humans who suffer from depression in the form of ‘learned helplessness’. However, the experiment could likewise be interpreted that the animals were simply conditioned to accept new thresholds for enduring pain, that they had been traumatized or both. Besides, drawing inferences from animal reactions for human mind states and motivation seems far-fetched and impossible to prove. Some years later Seligman distanced himself from his original research findings (Abramson et al., 1978). Behaviorism has valid, but limited applications. In clinical psychology behaviorist theory is typically complemented with cognitive theory to produce more efficient results (Feltham & Horton, 2006). In modern military education, issues such as professional ethics and mindfulness require cognitive skills and training (Major, 2014; Starr-Glass, 2013); the same applies to training in sports (Samson, 2014; Huntley & Kentzer, 2013). Behaviorism remains highly relevant in animal conditioning. It has however, with the advent of neurological imaging technology and the scientific measurement of cognitive processes (DeSouza et al., 2012; Kühn et al., 2014) ceased as a leading theory of learning. Few people know that Pavlov not only experimented on dogs, but also on children and that Skinner envisioned operant conditioning on societal scale, approaches that have become unacceptable in contemporary scientific ethics. Behaviorism does have its applications, but they must be seen in the context of human agency. Abramson, L.Y., Seligman, M.E.P. & Teasdale, J.D. (1978). Learned helplessness in humans: Critique and reformulation. Journal of Abnormal Psychology, 87, 49-74. Barrett, B. H., & Lindsley, O. R. (1962). Deficits in acquisition of operant discrimination and differentiation shown by institutionalized retarded children. American Journal of Mental Deficiency, 67, 424-435. Chalmers, D. J. (1996). The conscious mind: In search of a fundamental theory. New York: Oxford University Press. Chomsky, N. (1983) A review of B.F. Skinners verbal behavior. In Block, N., Readings in Philosophy of Psychology: Volume 1. Cambridge, Massachusetts: Harvard University Press. Degen, R. (2014). Brain-Based Learning: The Neurological Findings About the Human Brain that Every Teacher should Know to be Effective. Amity Global Business Review, 915-23. Dixon, M., Baker, J. C., & Sadowski, K. (2011). Applying Skinner’s Analysis of Verbal Behavior to Persons with Dementia. Behavior Therapy, 42(1), 120-126. Geiser, Robert L. 1978. “Review of ‘Behaviorism and ethics’.” American Journal Of Orthopsychiatry 48, no. 4: 736-738. PsycARTICLES, EBSCOhost (accessed August 12, 2014). Gökmenoğlu, T., Eret, E., & Kiraz, E. (2010). Crises, Reforms, and Scientific Improvements: Behaviorism in the Last Two Centuries. Ilkogretim Online, 9(1), 292-299. Huntley, E., & Kentzer, N. (2013). Group-based reflective practice in sport psychology: Experiences of two trainee sport and exercise scientists. Sport & Exercise Psychology Review, 9(2), 57-67. Kamarulzaman, W. (2012). Critical Review on Affect of Personality on Learning Styles. Online Submission, [serial online]. March 1, 2012; Available from: ERIC, Ipswich, MA. Accessed August 12, 2014. Major, A. (2014). Ethics Education of Military Leaders. Military Review, 94(2), 55-60. Pavlov, I. P. (1927). Conditioned Reflexes: An Investigation of the Physiological Activity of the Cerebral Cortex. Translated and Edited by G. V. Anrep. London: Oxford University Press. Reznikova, Z. (2007). Dialog with black box: using Information Theory to study animal language behaviour. Acta Ethologica, 10(1), 1–12. Rosander, P. (2013). The importance of personality, IQ and learning approaches: Predicting academic performance. Samson, A. (2014). Sources of Self-Efficacy During Marathon Training: A Qualitative, Longitudinal Investigation. Sport Psychologist, 28(2), 164-175. Seyfarth, R. M., & Cheney, D. L. (2010). Production, usage, and comprehension in animal vocalizations. Brain & Language, 115(1), 92–100. Starr-Glass, D. (2013). Experiences with Military Online Learners: Toward a Mindful Practice. Journal Of Online Learning & Teaching, 9(3), 353-364. Striepens, N., Matusch, A., Kendrick, K., Mihov, Y., Elmenhorst, D., Becker, B., & … Bauer, A. (2014). Oxytocin enhances attractiveness of unfamiliar female faces independent of the dopamine reward system. Psychoneuroendocrinology, 3974-87. Virues-Ortega, J., Rodríguez, V., & Yua, C. T. (2013). Prediction of treatment outcomes and longitudinal analysis in children with autism undergoing intensive behavioral intervention. International Journal Of Clinical Health & Psychology, 13(2), 91-100. Watanabe, S. (2007). How animal psychology contributes to animal welfare. Applied Animal Behaviour Science, 106(4), 193–202.